In the last five years or so, the banking industry has seen some major changes. Interest rates have plummeted. We’ve had at least one recession, and a recovery of sorts. The stock market has dropped like a rock and soared like an eagle. We’ve also seen the rise of online banks become a new-fangled curiosity to something that most of us accept as a standard. Online banks have made it normal to have services like bill-pay, electronic deposit, and easy to use online account management. They’ve also put the pressure on traditional brick and mortar institutions to revamp their services, lower their fees, and offer more for their users. But, they’ve also made it more difficult to decide on a bank. No longer do we just pick the best one of a handful in our town, or the one that mom and dad used to use. They’ve increased our selection, and made the decision a tad bit more difficult. So, how do we go about selecting our next bank? Even in our super digital world, where our physical locations are becoming less and less likely to matter, the location of your bank might make a difference to you. You might like the ability to walk into a branch of your bank and make a deposit, or talk to someone face to face. You might just like the security of knowing that you have that ability should you really need it. When you’re choosing your next bank, you really need to decide if having a local branch available to you is something that is important, or if it’s just something that might be nice. If it’s important, you’ll want to take most of the online banks off the list of eligible institutions right away. If it just might be nice, you can leave them on the list. There’s been a lot of talk about bank fees, hidden fees, and transaction fees lately. After the most recent housing market crash, and the new legislation on credit card transaction fees, many banks are trying to find new innovative ways of recouping the costs. They’re getting creative with their fees, and their fee structures. It should go without saying that you can have the best bank in the world, with all the shiny services, but if they’re adding on fees all over the place, they just aren’t that great. When you’re choosing your next bank, take a close look at their fees and fees structure. Does their checking/savings account have a monthly fee if you’re inactive? Does it have other monthly fees for services? Are the fees they have significantly higher than what other institutions charge? Fees that you don’t, or won’t, end up being charged might not seem all that important, but they can be an indicator of the future of the institutions fee structure. Be sure to make note of, or cross off entirely, any bank that has a difficult to understand fee schedule, or higher than average fees. Here’s where you can usually weed the really bad ones out. Maybe they have all the right locations, a huge ATM network, and better than average fees. All of that will be somewhat useless if they don’t have all the services that you want. Find out what services they offer. 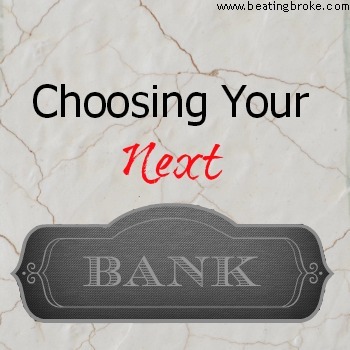 When choosing your next bank, be sure to check to make sure what services they offer. Make a list of services that you must have. Bill-Pay would be top of that list for me. If it’s an online bank, having some way of depositing checks electronically through an app on your phone might be high up on the list. Does their debit card offer cash back? Do they offer any rewards? What other perks does the account have? What perks would you like it to have? The truly analytically minded out there, like me, might just choose to use a spreadsheet to tick off what each candidate has, and use it to compare. There are plenty of choices out there. Decide on what it is that you want in a bank, and then go about finding one that offers it all. Chances are that you’ll find it. For me, I’m still using the Capital One 360 (used to be ING Direct) account I opened up years ago. I like that it’s easy to use, super simple to create sub accounts for categorization, and has very few fees. I’m also a fan of Ally bank, but their login process seems to lock me out about every third or fourth time I try and login. That’s not very convenient for me. 🙁 But, their rates are usually up there with the highest and their customer service is top notch. If you’re better at remembering your password than I am, they’re a good option as well. I’ve also heard good things about Perkstreet (2% cash back debit), and USAA, but haven’t used either to verify. I know there are plenty of other options that others rave about all the time. What is your favorite bank? What qualifications do you look for in a bank?